Are you a professional hair stylist that likes using a hair dryer with lots of power but you don’t want it to weigh your arms down as you work? 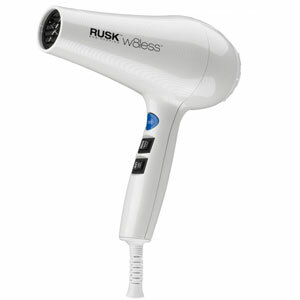 Those types of hair dryers are hard to find but Rusk Engineering has managed to do exactly that with this salon quality hair drying product. We were a little skeptical when we heard so many good things about this hair dryer that we had to take a closer look at it ourselves. If you want a professional hair dryer with power to burn then look no further. 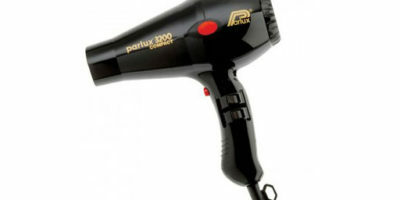 At 2000 watts it has all the heat and airflow power you will ever need in a hair dryer. We still have trouble believing that a professional blow dryer with that much power can be so lightweight. It also heats up using gentle far infrared heat that helps prevent over drying your hair. The air flow and heat coming out of this fine hair dryer are also greatly influenced by the coatings that are inside it too. There is a lot of ceramic coating on the heater parts in order to heat up the air coming out of the hair dryer more evenly. It also has some tourmaline crystal coatings inside of it also. These are advantageous because they form negative ions which help dry hair faster and prevent it from getting fizzy or from getting flyaway strands of hair. This salon quality hair dryer is somewhat versatile too thanks to its seven different heat and airflow combinations. It also has a handy cool shot feature that will help cool your newly styled hair quickly to set it in place. It was not easy to choose which feature on this salon quality product was the best one. It has some impressive heating and airflow for sure and the barrel coatings are very good too. What is most impressive to us is its weight though. Weight is so important in a hair dryer to any professional hair stylist because they use their hair dryer so often. A hair dryer that is lighter in weight should keep you fresh as you are styling hair because your arm won’t get tired as fast. 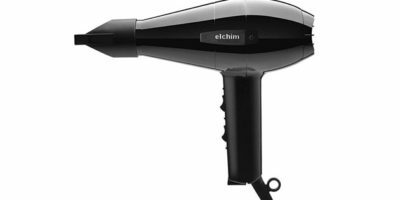 Hair dryer weight is something no professional hair stylist should overlook when buying a new hair dryer. There are a couple things on this hair dryer that maybe could be modified a bit by the manufacturer. For one, we know people like high heat and high air flow at some times but these settings on this Rusk Engineering hair dryer go a little overboard so some users don’t benefit from these settings. A little less heat and air might be good on the highest settings. This may be nitpicky but the speed and air buttons are made using toggle type switches. That makes them very easy to accidentally move since they are located right next to your fingers on the inside of the barrel. This is a pretty nice overall hair dryer buy despite its crazy high heat and air flow on its highest settings. Be sure not to use those settings if you purchase this hair dryer and have fine or thin hair. On the other hand, if you have hard to manage thick or coarse hair then this may be your salon dream machine. The bottom line is it has plenty of power, is very versatile, has a nicely coated barrel and is super-lightweight. We have no problem recommending you consider this hair dryer for purchase if you like what you have read here.